WWH93 – 9.5mm (3/8”) White Binding Wire 3:1 Pitch 34 Ring Box 100 -Binds up to 60 Sheets. Meter Wire Binding elements create a professional looking and secure document. 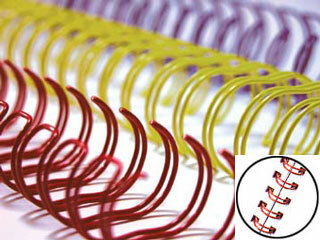 Meter 9mm White Wire Binding Coils 3:1 Pitch can be used with all brands of 3:1 pitch wire binding machines.